The Paleochristian and Byzantine Monuments of Thessalonika are a group of religious monuments known for their mosaics and distinct architectural typology. Thessaloniki is Greece's second largest city, situated in the northeast, in Macedonia prefecture. During its heydays, in the Byzantine period, it was also the empire's second city (to Constantinople, in that case). Thessaloniki derives its name from the first daughter of King Philip of Macedon. She married Kassandros, Alexander the Great's general who succeeded him on the throne. He gave her name to the city he founded around 316 B.C. Thessaloniki is a typical large Greek city. This means four lane roads across the city center, creative parking and so on. 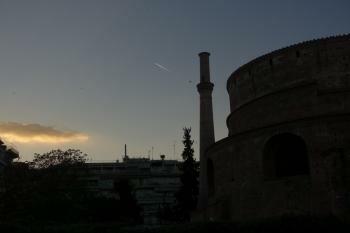 The city's most prominent landmarks are the White Tower (lovely posted near the sea) and the Ayia Sofia. This church has an imposing front, and quite distinguished interior. The main colours inside are a kind of dark green, black and bordeaux. Somewhat mystique, especially in combination with the scarce glimpses of sunlight that manage to get in. There are also innumerable small Byzantine churches scattered around the city. Quite often they are hidden behind apartment blocks, or blocked from the view by parked cars. If you've got some stamina and good walking shoes you can visit several of them, and also enjoy their frescoes. I only had half a day to visit the inscribed sites in Thessaloniki so I had had to plan my visit in detail. First I picked the churches I wanted to visit most (7 out of 14) and planned a route which went through them. They are all not far from each other and the route can be perfectly done by foot. The problem is finding out the opening times. From the ones I wanted to visit (Rotunda, Acheiropoietos, Hagia Sophia, Panagia Chalkeon, Hagios Demetrios, Hosios David and Nikloaus Orfanos) only the Rotunda now serves as a museum. All the others are functioning churches and it is practically impossible to find out whether they are open to visitors or not before you head there unless you can call them before and talk to the priests in Greek. I was lucky though. In a summer Friday morning all the churches were open, although there were services taking place in three of them. Despite processes of secularisation, Greece is still a deeply religious country. Even morning masses in a working day proved to be well visited. It was impossible to visit the churches during service, but I could still stand at the door, listen to the liturgy and catch a glimpse of the interior, which is way better that standing in front of a closed church. 1) The Rotunda surprised me as a very impressive massive Roman building. It was the second largest Roman building at the time after the Pantheon. Its walls are 5 meters thick and the ceiling still looks very high even to modern eyes. Many of the frescoes survived and I found Rotunda to be the most impressive of the churches for its size, form and time of construction. Nearby is the Galerius Palace which includes an underground visitor centre and Arch of Galerius. Both were initially planned as a part of the nomination, but were later omitted as the nomination shifted to focus only on the Byzantine heritage. Yet it is worthwhile to visit them as they provide some background as to what Roman Thessaloniki looked like when the Rotunda was built. The Rotunda was not planned as a church at all, but probably as a mausoleum for Galerius. It was, however, turned into a church soon after its completion. 2) Hagia Sophia is the largest of the inscribed churches. 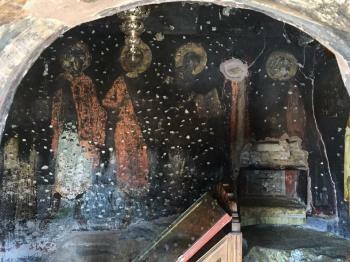 It has some nice frescoes, but many were destroyed in a fire in 1890. It surprised me to find out that the Ottomans renovated it (as a mosque), but without interfering too strongly with the original style of the church. They added some faux marble which fits the church in both colour and form. 3) Hagios Demetrios has a very nice prolonged nave, somewhat similar to Acheiropoietos. I couldn't pay any of the two the attention they deserved due to the masses being held there during my visit, but I still stepped in. The catacombs of Hagios Demeterios can be visited even during service. You need to be audacious enough to cross the entire church. In the back of the church you can descend and visit the museum downstairs, listening to the service from below. The museum features only Greek signs, but is still nice to visit. 4) Niklaus Orfanos has the nicest frescoes. It has never been destroyed or ceased to function as a church. It is covered by beautiful floor to ceiling frescoes. Similar to nearby Hosios David it is in the Ano Poli (Upper Town), with characteristic steep narrow streets and old Ottoman houses. 5) When I finished with the churches I went on to visit the Byzantine fortifications. I visited Trigonio, a watch tower. Nearby are numerous cafes with a view of the entire city and the sea. I then walked to Heptapyrgion, a complex that used to serve as a citadel and then as a prison. The outer layer still looks original and it is fun to walk around. It is now used to show some modern art exhibitions and I found them to disagree with the setting. In general, Thessaloniki gives you a good impression of the history of Byzantine architecture. 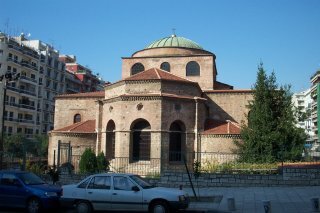 It has well preserved churches from each age during the history of Byzantium. The churches are also different enough to merit visiting several, or even all of them. 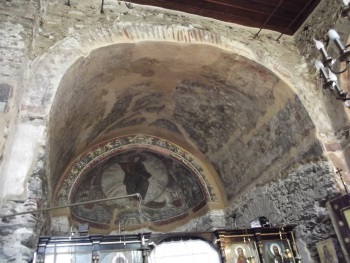 The frescoes in most churches were a bit disappointing, but Nikolaus Orfanos was a good compensation in this respect. I would additionally wholeheartedly recommend visiting the Archaeological Museum of Thessaloniki. It is well designed, with bilingual signs and all of the exhibits originate from Macedonia. Its collection of Macedonian gold objects is of world quality. It struck me how rich and technologically advanced the Greeks of the northern provinces were during antiquity, as they are by far less known than their southern counterparts of the Peloponnese. Late antiquity, the rise of Christianity and the early Byzantine empire are periods of history I have grown fond of. When you come from a site like the Pantheon in Rome or Diocletian’s palace in Split and go to a church like San Vitale in Ravenna, you actually see the epic change that took place in late antiquity. 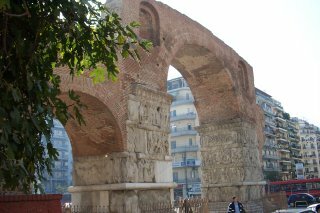 Thessaloniki is part of the transition and you will find plenty of sites from the late Roman (300 CE) period as well as early Byzantine period. Thessaloniki functioned as my hub during my exploration of the Northern Greek WHS. So most of the site seeing was done at late hours and I did not manage to see all I had set out to visit. But possibly due to the upcoming Easter holiday, church services were held mostly in the evenings allowing me to sneak into most. Of the churches I found St Demetrios the most impressive. Also the tiny chapels gave a good impression of early Christianity. Comparatively, though, Thessaloniki is a bit underwhelming. To me Ravenna offers the better early Byzantine churches. I also found the paleo Christian sites in Italy more appealing (e.g. St Ambrosius in Milan, not a WHS). And the ruins scattered across the city are similar to a site like Merida in Spain. I did wonder why the Roman forum and the palace of Galerius are not included. Generally, I approve of the reduced scope of the inscription. Sure, Thessaloniki has a nice coast line, but the city itself isn’t nice, featuring primarily Mediterranean concrete appartment blocks. It’s really only about the sites themselves. Thessaloniki has it’s own hotspot. Aigai, Philippi and the city itself are easy. Meteora is straightforward, too, but it’s a long, possibly very early, but certainly very rewarding day trip. Mount Athos meanwhile could be difficult to do in a day by public transport. And it doesn’t really make sense anyhow if you can get a permit. Finally, Pirin seems impossible, taking into account that you need to cross the border. Twice. And getting into the park isn’t all that straightforward. The train station is within walking distance of the city center, albeit due to the ongoing construction work for the new metro it’s a bit more complicated. The main bus station for all destinations other than Ouranoupoulis is in the North and well connected via bus line #8. For Ouranoupolis you have to go to the Southern terminal, the easiest option being a cab. For some strange reason the hotels are regularly fully booked over weekends. I normally book really late and rarely had any issues with this approach. In Thessaloniki it cost me dearly. In the end I was just happy to find a room. My recommendation would be to skip Thessaloniki over the weekend or to reserve well in advance. It is possible to see all inscribed properties in just one day, but you have to start early as some churches are open only from 9am to 11am (Panagia Chalkeon). The most impressive for me was St. Demetrios although its interior looks very new and it’s hard to feel the byzantine atmosphere there. The most beautiful is Osios David/Latomou Monastery. Some of the churches are closed for the public (Christ Saviour). The most beautiful view of the city can be seen from Blatades Monastery and the northern city walls. I really recommend a guidebook Monuments of Thessaloniki by Nikos Papachatzis in which you will find lots of info about early Christian and byzantine monuments; keeping it in hands while walking through the city you will have a chance to see many details that you would not have noticed without it. 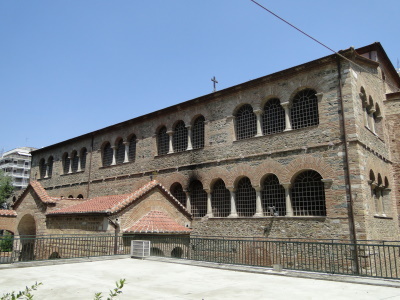 I agree with Charilaos' comment that the church of Ossios David is the most atmospheric of the WHSs in Thessalonika. More like a cave than a building, it is located on a hill overlooking the city. 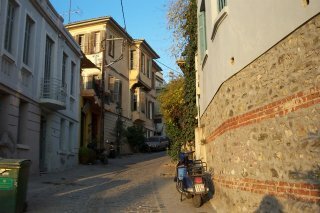 I hungered to again walk in the streets of Thessaloniki, and, arrived in late May for a two week stay. I do not like the tourist season, with its heat and crowds. God forgive me, but I do not like streets crowded by the "barbarians from the North". As they bring back nightmares and memories of prayers to have enough bullets to kill some invaders before we die, when they come again; and, the pictures given to me of Jewish children and babies hiding in nook and crannies of the Castle walls where their parents placed them before they took the trains to the North, and, never to return. A City of my Heart and a City of my nightmares. It has lost its sparkle in some ways. The Barbarians have moved in and every wall possible has words of hate painted on it. Even in the centre of the City square nobody bothers removing the words of hate; not even from the walls surrounding some churches. The words are always about someone else is at fault. The Barabrians always see themselves as innocents. The day breaks and the sunsets are still filled with Gods light. The gentle warm breezes of the early mornings, when standing on the castle walls looking down on to the Harbour, are still like kisses from Heaven. The real locals always wish me "Good Morning" as they go for their morning walk, or are watering their pot plants. I always thank them for their greeting, and, wish them a Good Morning as well. The barbarians have not overcome civilization. One early evening I took a walk through the long grass of the Castle to reach the south west corner of the walls, and, to climb up the thick walls to see the moon rising above the horizon. A concerned voice asked me "what is an old man like you doing on top of that wall, have you forgotten your age". I replied "I left Thessaloniki when I was young and when I return, I always return a youngster, I forget the wasted years in exile". We looked at each for a long time, and, the equally old man said "Kala na eise", may you be well; and, I wished him well. He sat five metres below me on a steel bench to watch the sunset as the moon rose, to bath the earth with a yellow light. Out of nowhere a people started arriving with musical instruments; it looked like a small Symphony Orchestra. My new friend on the steel bench below me asked a young lady with a Viola what was happening. As a protest about the Government cut backs, the Orchestra was going to play music to entertain the locals. Rather than march in the streets, and, make life difficult. As they played a Verdi favorite, the music seemed to flow down on to the City. The moonlight and the music becoming one. The Barbarians have lost another Battle. Just back from a visit of Thessaloniki, the City of my Heart. A city many times encircled by its enemies, now encirled by Suburbia and motorways and "Cathedrals of Consumerism". Poverty, disease and darkness is terrible, but a city encircled by the Cathedrals of Trash is scarry as well. I walked around the Castle Hill of Thessaloniki touching the scultured stones of different eras, build into the Castle walls. Were the sculpters Greek, "Romans", Armenians, Persians, Hebrews, "Franks" or "Ottomans"? Even if one is a slave the satisfaction of creating a thing of beauty is immence for humanity, and, nothing can take the joy of beauty & creation away from anyone. In the solitude of early morning warm light, while the city was still half asleep, I paid homage to those who lived and hungered for beauty. In the touch of every stone, in the summers warm morning light, one could allmost feel the warmth of the artists hand, the creators of beauty. I was back in Greece to light candles on the graves of my past loved ones. I thought it was only fitting that I should also light a large candle, in a recess of the wall, to all the creators of beauty whose names are lost, but whose joy remains. The very small Church of "Osios David" adjacent to the hill top Castle walls of Thessaloniki, has a charm and human scale above many of the other churches. In a concrete city the softness of its stones and trees are very welcoming. Thessalonikis very easy access to the sea meant that many conquerors or rulers demolished buildings of earlier times and send them as far as Sicily and even Syria. Osios David has Columns and stones that are obviously broken left over items from the lucrative export industry. Thessaloniki and its hinterlands easy sea access has left very few items from above ground buildings. If you walk along the walls of the hill top castle, you can see broken carved columns and carved stones build in to the walls. The pity is that even in the last ten years, some items have been dug out and sold. I believe one column top remains visible on the south east of the wall, that is a replica of the few columns remaining at Pella, Alexanders City, 40Km away. If you have an interest in human History & Geography, and its winter with no glare, get a good Russian detail map, Greeks do not print maps?, its possible to see 10,000 years of human history carved out in the surrounding landscape of Thessalonikis hinterland. Thessalonikis treasures are far greater than the obvious churches and a few public buildings. Think small scale and less than 1000 years old, and surprisingly enough quiet a few gems remain. Some buildings "modernised" in the 1960's & 1970's waiting to be restored. Even in 1962 a mad priest and a peasant mayor modernising the facade of one of the historic Church facades, endeavouring to make it look like a cheap cafe. Some of the 200 year buildings are being left to decay, would be treated as national treasures in other countries. The reality is that anything that is less than a 1000 years old is being removed or allowed to disappear. Greeks like the Turks are cannot tolerate any historical item that may suggest a multicultural recent past. People with little education cannot comprehend that we have more that binds us together, than separates us. I have visited Thessaloniki one week ago (August 2008), and I have been deeply impressed by the town. The walk along the waterfront is wonderful and you really can feel the greatness of the town`s position with its historical gulf. Looking at Alexander o Megas statue near the sea gives you a tip about the importance of this metropolis, WH objects are easy to find as streets in Th. are so regular. I particularly appreciated the church of Saint Demetrius, simply amazing...Walk and walk, since the town is really big. Via EGNATIA, the ancient street which linked Brindisi (and Rome)in Italy to Costantinopoli is alive and kicking there, full of traffic. I would not go to Th. in August since it gets very hot in the afternoon. IMPORTANT> do not forget to walk up the the amazing, fantastic byzantine walls that still sorround the town. YOu can have a fantastic view of Thessaloniki and the gulf from there, at sunset for example, and have good meals in scattered taberna all around. I LOVE THESSALONIKI! Bring a good pair of shoes and city map! Its not a bad city and has plenty to offer. Most of the sites are difficult to find and even more difficult to enter. But its still nice to go hunting for them. Thessaloniki was a pleasant surprise for me. I hadn't thought much about it before, but it's really a very clean and modern metropolis with a nice view of the sea (especially from the top of the White Tower) and a much milder (and less smoggy) climate than Athens. Its WH monuments are scattered throughout the city, but are easy to find and represent a good cross-section of the city's history from ancient Greek and Roman to Byzantine and Turkish times. The Byzantine churches especially are very interesting, but also the remains of the Roman Palace and the Triumphal Arch merit a closer look. I wouldn't go to the city just for its WH value, but there are many other reasons to go there, and seeing its historical buildings is definitely a good way to become acquainted with Thessaloniki. The Tetrarchy: Galerius, as Caesar of Illyricum, chose Thessalonika to become the main centre for his court between 293/311. He created a monumental quarter and ordered the building of a Triumphal arch to celebrate his victory over the Persians in 298 (which included the taking of Ctesiphon)- it was dedicated in 302. By 306 he was "Augustus" and ordered the building of the Rotunda probably as a Temple. Mosques converted from churches , cathedrals or synagogues: Galerius' Masoleum which was turned into a church (St Gregorios and not Demitrius) and then into a mosque. Mosque: The Church of the Acheiropoietos was converted into a mosque and is nowadays referred to as the Old Mosque. Cathedrals: Hagia Sophia - "In 1205, when the Fourth Crusade captured the city, the Hagia Sophia was converted into the cathedral of Thessaloniki, which it remained after the city was returned to the Byzantine Empire in 1246." Named after individual people: Thessalonica, the sister of Alexander the great. Reduced from broader TWHS: TWHS originally included archaeic and classical monuments of Thessaloniki. 212 Community Members have visited.